I Pity The Fool That Doesn't Buy This A-Team R/C Car! | OhGizmo! If you are a big fan of 80’s pop culture, then there’s a chance you’ve already picked yourself up a Knight Rider R/C car. Sure, KITT was an awesome car, but what about that sweet GMC van that the A-Team rode around in? 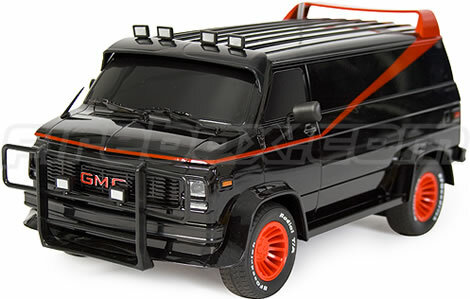 If you want to add another 80’s icon to your collection of R/C cars, then the A-Team van is probably the way to go. Unfortunately there’s not really anything exciting about this, aside from the looks. It’s an officially licensed product which runs on 4x AA batteries and 1 9v. It’ll set you back around $60. Personally, I’m holding out for a Back to the Future DeLorean R/C car. Yeah, that’s a pretty cool RC car. The A-team, just like Knight Rider, is one of those shows that were cool when you were ten, but are ridiculous as hell as you watch them now. But anyway, the car is and always will be übercool.